Visiting the Strutt House by Bike, Take II ! James Strutt was a Canadian Modernist architect who designed many innovative buldings throughout the National Capital Region. In 1956 he designed and built his family home along Chemin de la Montagne on the western edge of Gatineau Park. Lauded for it’s ingenious use of modular components and the introduction of hyperbolic paraboloids to form the ceiling and roof, the house has won a number of accolades such as the Prix du vingtième siècle by the Royal Architectural Institue of Canada. In the summer of 2015 I visited the The Strutt House for the first time. Little did I know it had just been saved from demolition. The National Capital Commission and the Strutt Foundation, an incredibly dedicated and passionate group of volunteers, had only recently come to an agreement to rehabilitate and preserve this very important modern piece of architecture after it had been vacant for a number of years and fallen into disrepair . The Strutt House has been included in the NCC Confederation Pavillions program and opened to visitors in time for Canada’s 150th birthday celebration. As part of this program you can book a tour of the house with the Strutt Foundation, which I highly recommend. 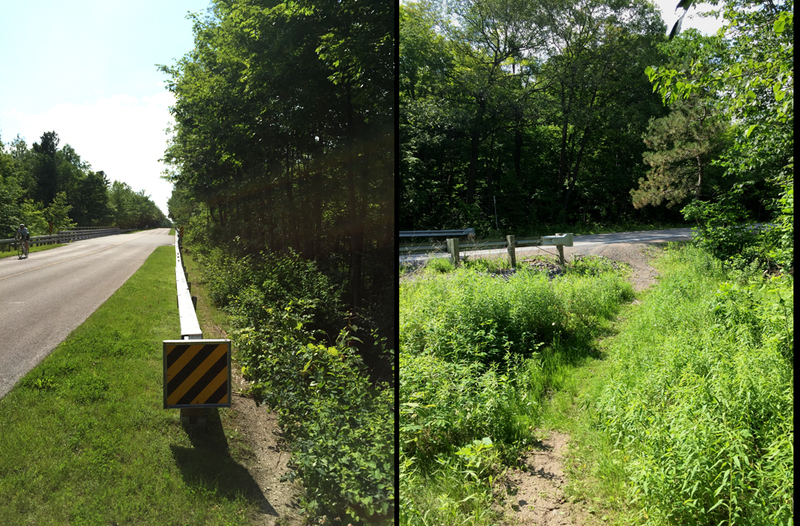 The following is an update to the initial 2015 ride and includes a vastly improved approach to the site that avoids having to travel along Notch Road and Chemin de la Montagne. Early Saturday morning four of us met up on the Quebec side of the Portage Bridge where we set out on our adventure. We followed multi-use-paths along the Ottawa River before cutting up along more paths through the southern section of Gatineau Park. Once arrived at the park info kiosk, indicated by the red marker on the above map, we rode along the Gatineau Parkway, which is always in great condition because they close the Parkway in late Fall every year. Subsequently the Parkway doesn’t have to be plowed and salted which, along with the freezing and thawing cycles throughout the winter, wreak havoc on all our other roads. On Saturday mornings there are lots and lots of cyclists riding along the Parkway so drivers tend to be quite well behaved. After a healthy climb up past the Pink Lake lookout and beyond we arrived at the top of the Notch Road overpass. There’s a short dirt path off to the right just before the overpass that we followed down to access Notch Road. 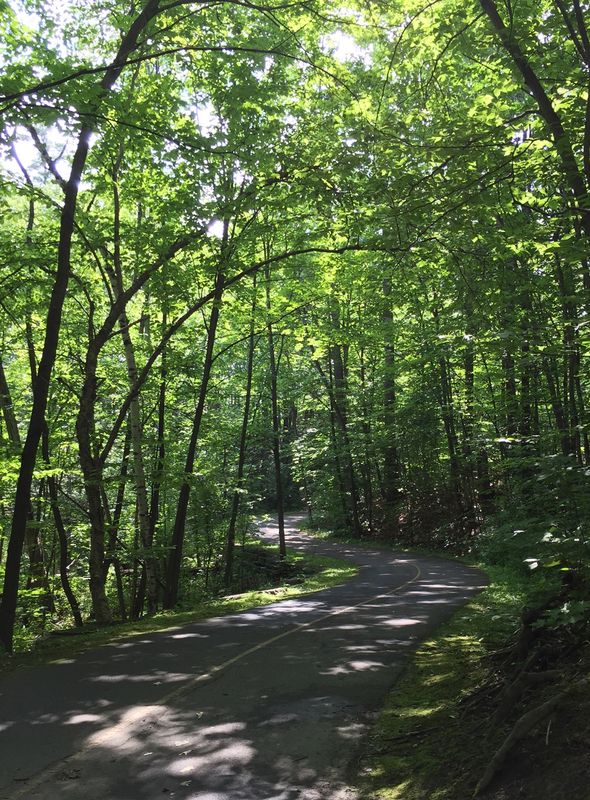 Notch Road is a steep narrow incline down to Chemin de la Montagne, however a short distance down from the Parkway there is a an old dirt road with a wide enough opening to push our bikes past the gate. We rode through the woods along the dirt road until we came to a more recently upgraded section of dirt road that veered off to the left down towards the Strutt House. Once arrived we were treated to a great tour of the house by Titania and Brian of the Strutt Foundation. A great ride to a fantastic destination. Can’t get better than that. Author ottawaveloPosted on June 19, 2017 September 12, 2018 Categories Art & Architecture, Suggested rides for visitors to the region3 Comments on Visiting the Strutt House by Bike, Take II ! Architects on Bikes Checking Out Buildings is a series whereby I invite an architect to suggest a few buildings they admire in the region, then we ride around and check them out! I am very grateful to Mark Glassford for generously accepting my invitation. Joining us was another architect Susan Smith. Our first building and starting point was the SITE building designed by Ronald Keenberg, located on the southernmost point of the University of Ottawa main campus. It is a located in a tight and unconventional foot print, whose design sympathetically considers all varied approaches, perspectives and vistas. These images are from King Edward Avenue near the main entrance, the approach most accessible by bike. We headed to the lights across King Edward Ave to Templeton, and then wove our way along quiet streets through Sandy Hill and Lowertown to get to the Delegation of the Ismaili Imamat, headquarters of the Aga Khan Foundation Canada on Sussex Drive, designed by Fumihiko Maki. I managed to check out the interior of the building during this years Doors Open event. We then took the bike path along the MacDonald Cartier Bridge over the Ottawa River to Gatineau, then followed the Voyageurs Pathway east. Once across the Lady Aberdeen Bridge over the Gatineau River we turned right along the path that runs between Rue Jacques Cartier and the waters edge, along which there are multiple opportunities to pause and take in some great views of the Ottawa River. At the northern tip of Rue Jacques Cartier we headed inland and rode along the bike path beside Montée Paiement, which brought us to our third stop, The Library and Archives Canada Preservation Centre. Also designed by architect Ronald Keenberg, this is an incredible climate controlled facility. There is a bike path that rings the building allowing one to admire it from multiple perspectives.